On this page you will find a brief introduction to the stormwater work in the Mt Eden area followed by updates. The realignment works should be finished before the middle of the year. City Rail Link's C6 contract involves diverting a section of the existing Mt Eden stormwater pipe. It creates a new alignment between Water and Nikau Streets to enable CRL's redevelopment of the Mt Eden train station. The existing stormwater pipe is in the path of the new CRL tunnels that will be built there. March Bessac Joint Venture (MBJV) was awarded the contract to undertake the works. MBJV is a partnership between NZ-based company March Construction and specialist French-based tunnelling company Bessac. A micro-tunnel boring machine named Jeffie will simultaneously tunnel and lay a replacement 420-metre section of stormwater pipe. She has been launched from a 16m-deep shaft at Water Street and is expected to arrive at her Nikau Street reception shaft in April. In addition to the stormwater realignment, pollutant traps were installed at Boston and Normandy Roads as part of the stormwater network improvements for Auckland. They capture large and non-biodegradable waste such as litter and coarse sediment to prevent it reaching waterways. The tunneling is being done by a German-built Herrenknecht AVN machine. You can read about how it works here. The machine was named Jeffie following a hugely popular CRL social naming contest. The most popular name was Jeff but traditionally such machines adopt a female name so Jeffie - a popular girls name in the early 1900s- was chosen. Naming digging equipment after women is said to be a tradition that dates to the 1500s when miners prayed to St. Barbara to keep them safe underground. Saint Barbara is the patron saint of armourers, artillerymen, military engineers, miners and others who work with explosives because her legend associated her with lightning. Jeffie has completed the first 100 metres of her 420-metre pipe-jack journey. Jeffie – the micro tunnel boring machine installing a replacement stormwater main through Mt Eden – started her 420m pipe-jack journey from Water St today. Tunnelling at a depth of about 17m, Jeffie is expected to arrive at her Nikau St reception shaft in late March. The existing stormwater main lies in the path of the future CRL tunnels at Mt Eden, so must be diverted before work can begin on building the new station and twin underground tunnels in the area. Today Jeffie, the tunnel boring machine being used at Mt Eden, was lowered into the launch shaft in Water Street and will start her pipejack journey towards Nikau Street in the new year. Jeffie will be used to help divert a section of the existing Mt Eden stormwater pipe, which will be in the way of the CRL tunnel. A blessing was held today for Jeffie, the tunnel boring machine being used at Mt Eden. Jeffie is expected to be lowered into the launch shaft in Water Street by Christmas and start her pipejack journey towards Nikau Street in the new year. St Barbara is the patron saint of miners and tunnellers. A statuette of her was carried by MBJV tunnel supervisor Laurent LeCalvez down the shaft at Mt Eden where tunnel boring machine Jeffie will be used to help divert a section of the existing Mt Eden stormwater pipe, which will be in the way of the CRL tunnel. It’s traditional when a new project starts for a small shrine to Santa Barbara to be set up at the tunnel, followed by a dedication and an invocation to Santa Barbara for protection of the workers. At Mt Eden, work is progressing on construction of 17-metre-deep shafts required as part of CRL’s stormwater realignment contract. Contractor March Bessac is tasked with diverting a 420-metre section of stormwater main that lies in the path of the future CRL tunnels at Mt Eden. The new main will be installed by a micro tunnel boring machine named ‘Jeffie’, who is expected to be lowered into the Water Street launch shaft in December and start her journey towards the Nikau Street reception shaft in the New Year. The concrete pipe segments that will be pushed along behind Jeffie as she bores the new stormwater tunnel continue to arrive at the Water Street construction site. A bentonite plant has also been established to assist with the pipe-jack work. Bentonite is a special type of clay used in tunnelling to create a fluid sleeve around the pipeline to help keep the soil from closing in during works. A bentonite slurry circuit is also used to carry the tunnel cuttings to the surface for separation. The treatment plant separates the solids from the bentonite fluid and returns it to the tunnelling machine. The solid material generated will be carted to a certified fill site. A special ceremony for Jeffie will be held on 4 December, St Barbara’s Day. St Barbara is the patron saint of miners, making it an appropriate day to hold a ceremony to bless the workers and equipment before the tunnelling work begins. Ground support work has begun at CRL’s Ruru St site in Eden Terrace. Posts are being installed before construction of a 15m-deep shaft that will receive the mini tunnel-boring machine (TBM) that will lay a replacement stormwater pipe from Water St. The existing stormwater main lies in the path of the future CRL tunnels at Mt Eden, so must be diverted before CRL’s station and tunnel works can begin in the area. Contractor March Bessac JV is also completing piling works at the Water Street site in preparation for the 17m-deep shaft that will launch the TBM on her 400-metre journey. ‘Jeffie’, the mini tunnel boring machine that will pipe-jack a replacement stormwater line at Mt Eden ahead of CRL tunnelling works, has arrived on site at Mt Eden Road. A German-built Herrenknecht AVN machine, Jeffie was sent to New Zealand from her base in Toulouse, France. She’s expected to start work in October - simultaneously excavating and laying a replacement 400-metre section of stormwater pipe between Water Street and the Ruru Street. The existing stormwater main lies in the way of the future CRL tunnels at Mt Eden. Piling works have begun at the end of Water Street ahead of CRL’s Mt Eden stormwater realignment works. Contractor March Bessac Joint Venture (MBJV) is installing 89 piles to support the ground before it starts construction of the 17-metre-deep shaft that will launch Jeffie on her pipe-jacking mission. Work on the Water Street shaft is expected to begin late August, with all piling works completed in early September. In addition to the stormwater realignment, pollutant traps are being installed at Boston and Normandy Roads as part of the stormwater network improvements for Auckland. They will capture large and non-biodegradable waste such as litter and coarse sediment to prevent it reaching waterways. At CRL’s Water Street site, construction is about to begin on the 17-metre-deep shaft required to launch the micro tunnel-boring machine (MTBM) that will install the new Mt Eden stormwater line. The existing stormwater main sits lies in the way of the future CRL tunnels at Mt Eden, so a 400-metre section of the main must be diverted before the project’s main station and tunnels work can begin in the area. A piling rig will start installing the shaft walls this month. Contractor March Bessac Joint Venture (MBJV) has selected equipment that minimises noise and vibration as much as possible, in this case a rig that bores the piles with a large auger rather than hammering steel piles into the ground. ‘Jeffie’, the MTBM that will pipejack the replacement stormwater main, is making her way to Auckland from France. She is due to arrive in mid-July and start pipejacking in October. A second shaft will be created on the corner of Ruru and Nikau Streets, where Jeffie will complete her journey and be lifted out of the ground. We're almost ready to start diverting a section of the existing Mt Eden stormwater pipe. This is all that remains of the former Hyde Group building at Ruru St. This needed to go before we start on the stormwater pipe. 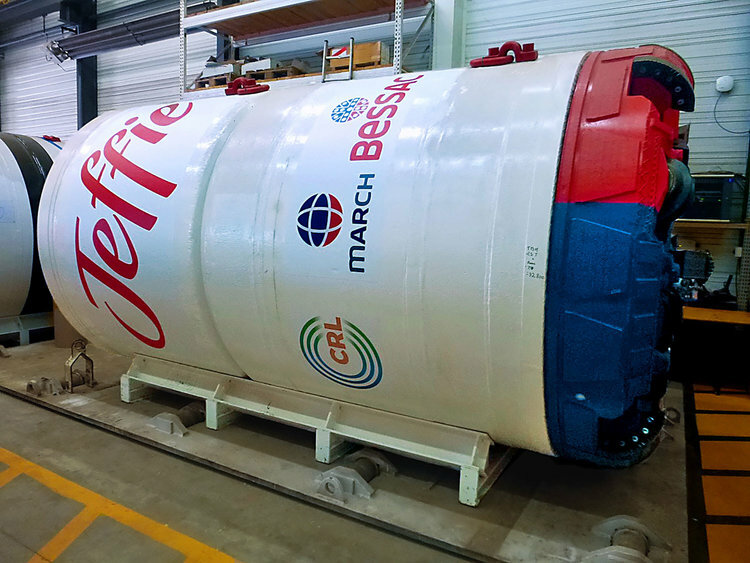 The new micro tunnel boring machine (MTBM) named Jeffie is now on its way from France. She'll be working on the Mt Eden stormwater realignment. Jeffie will be launched from Water Street and travel underground to Ruru St to divert the stormwater line which is currently in the way of where the tunnels will be. They're gone! The apartment building at 26 Mt Eden Road has now been demolished. Here are the latest pictures showing the status of the demolition of the apartments at 26 Mt Eden Road. The demolition at 26 Mt Eden Road is continuing. Before the stormwater diversion, CRL needs to demolish apartments at 26 Mt Eden Road and the former Hyde Group building on the corner of Nikau and Ruru Streets. The demolition began today at 26 Mt Eden Road.